The state is taking action after banning a Bay Area assisted living facility from admitting any new residents. 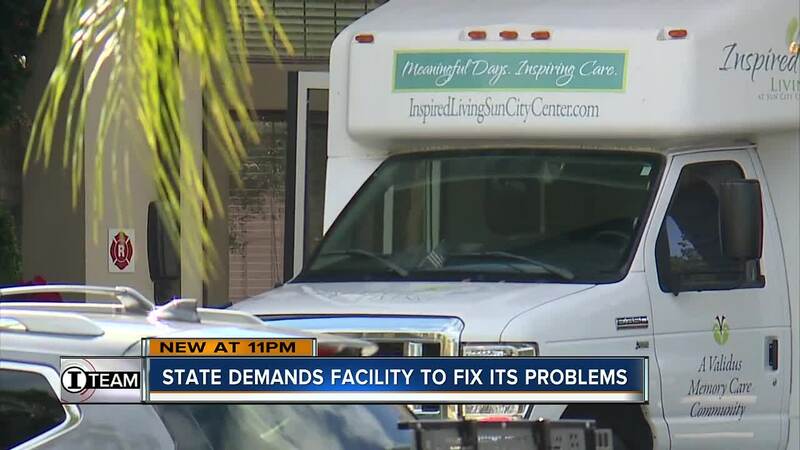 A day after I-Team Investigator Kylie McGivern reported on the moratorium, state regulators sent managers at Inspired Living at Sun City Center a letter, giving the facility 30 days to fix its problems. The Agency for Health Care Administration (AHCA) wants the home that serves residents with dementia and Alzheimer's disease to put new safety plans in place to supervise residents and prevent abuse. A state investigation into the facility found incidents of sexual assault and violent behavior by residents against other residents and said the assisted living facility didn't do enough to stop it. Now the state is recommending more staff training, particularly to prevent staff from abusing residents and residents from abusing other residents. To be clear, the state's report only referenced incidents of resident to resident abuse, not staff to resident abuse. There's also a recommendation to continue to follow steps outlined in a plan Inspired Living at Sun City Center put forward, to develop "a facility-wide process for the assessment and evaluation of facility residents." The state says the process should include steps to determine what level of supervision and oversight is necessary for the resident to safely remain in the facility. The state's improvement plan also calls for updates on how the home reports abuse and neglect, and a requirement to notify family members of any abuse - something the investigation found the facility failed to do. The I-Team also learned the executive director at Inspired Living at Sun City Center resigned on Dec. 3, two days before the state relased its investigation. "Late this morning, we received the State’s corrective recommendations report. We are in the process of implementing all the State’s administrative recommendations, none of which are care related, and we expect to have all that work completed and resolved tonight. We are working closely with the State to ensure we can continue to serve our community and provide the highest quality care for those who suffer from dementia and Alzheimer’s disease." ACHA told the I-Team, "The facility must formulate the corrective action plan to address the cited deficient practice. The Agency will review the plan as part of its monitoring and follow-up processes." That corrective action plan is due by Dec. 21.